If things had gone according to form of even the most optimistic prognosticators, the Birds would have finished their 2017 season at 9-7, which would have earned them the title of NFC East Division winners in a weak division or an invite to the playoffs as a Wildcard team. And whether they would have played a home playoff game last week in the friendly but frigid confines of Lincoln Financial Field or not, a playoff birth for the first time in four years is something that most fans would have been ecstatic about, as it would have signaled that this team was trending upwards and making great strides to becoming a contender in the near future. But somewhere around Halloween, all those predictions were thrown out along with that deformed pumpkin sitting on your porch. Somewhere along the way, a team that most expected to go 8-8, 9-7, or 10-6 as a stretch, started out 7-1. Somewhere along the way, the steady improvement that we hoped to see in a 2nd year quarterback from a state most Eagles fans knew very little about turned into a franchise quarterback blossoming before our very eyes. In 2017, Carson Wentz became the kind of quarterback that we had previously watched and envied from afar, as the kind of rare talents he displayed were always found on other teams, but never our own. And his play made those around him look better as well. But saying that all of this team’s success was strictly due to the quarterback would be an injustice. The general manager definitely deserves a good amount of credit as well. And his story his one of persistence. Howie Roseman was sending letters to various NFL teams in the hopes of getting his foot in the door any way he could. And when the Eagles finally gave him that opportunity in 2000, he started his Eagles career as an unpaid intern who had to share the side of a desk as his workspace. But the kid from Marlboro, NJ, who grew up a Jets fan and eventually moved up the Eagles ladder to the general manager position, had to move up not once, but TWICE in the 2016 NFL Draft to acquire the quarterback he coveted. And not only does it seem that he got the right guy, but he got his franchise quarterback some help in areas that were vastly deficient just a year ago. While the Eagles finished 7-9 just a year ago, it was fairly evident that the areas of wide receiver, the secondary, and the defensive line needed to be vastly improved in order for this team to make a playoff run. It was Roseman who signed Alshon Jeffery & Torrey Smith, and traded a reliable receiver in Jordan Matthews to acquire cornerback help in Ronald Darby. It was Roseman who traded for Tim Jernigan, who has become a stalwart on the defensive line. It was Roseman who traded for running back Jay Ajayi, who is expected to be the workhorse against the Falcons and help take the pressure off of Nick Foles. But while the Eagles were flying high after a tough December win on the road against a quality playoff opponent in the LA Rams, that win was tempered by the knowledge that the Birds had lost their franchise quarterback for the remainder of the year. But while the loss of Wentz was a huge blow to the Eagles Super Bowl chances, the “lucky” part to what was an unlucky situation was that the injury took place so late in the season. Backup Nick Foles, who ironically was the starting quarterback for this team the last time they made the playoffs in 2013, not only played admirably in the 2nd half of that game, but the win had the Birds at 11-2 and NFC East division winners. With only two games remaining against subpar competition, the team was able to play just well enough to secure the #1 seed and homefield throughout the playoffs. But with Foles and the offense looking mediocre over the last few weeks, naturally questions have arisen as to whether the backup has what it takes to get this team to the Super Bowl. Everyone knows that Nick Foles is not Carson Wentz. But the good news is that he does not need to be. And Foles does not need to replicate his 2013 season either…a season where he threw 27 touchdowns and only two interceptions. He just needs to manage the game and let the other pieces around him do their job. The most important aspect of the Eagles chances to win their next two games and advance to the Super Bowl is that both games will be played in the friendly confines of Lincoln Financial Field. At approx. 4:25 PM this Saturday afternoon, right around the time that the Eagles players are introduced on the field, the excitement at the Linc will start to build. And by the time the coin toss is completed and Adrian emerges from her coma on the big screen to tell Rocky that the only thing she wants him to do is “WIN”, the noise level will have reached a crescendo. Four years is a long time to wait for a playoff game, especially for a fan base that is on 57 years and counting for a championship. And just as Adrian emerged from her coma, this team, whose offense has played in a comatose state for the last two games, will have to emerge and fight for their playoff lives. Most outsiders do not expect them to succeed. The Eagles are the first #1 seed in history to be considered underdogs in the playoffs against a #6 seed, which is what the Atlanta Falcons are. 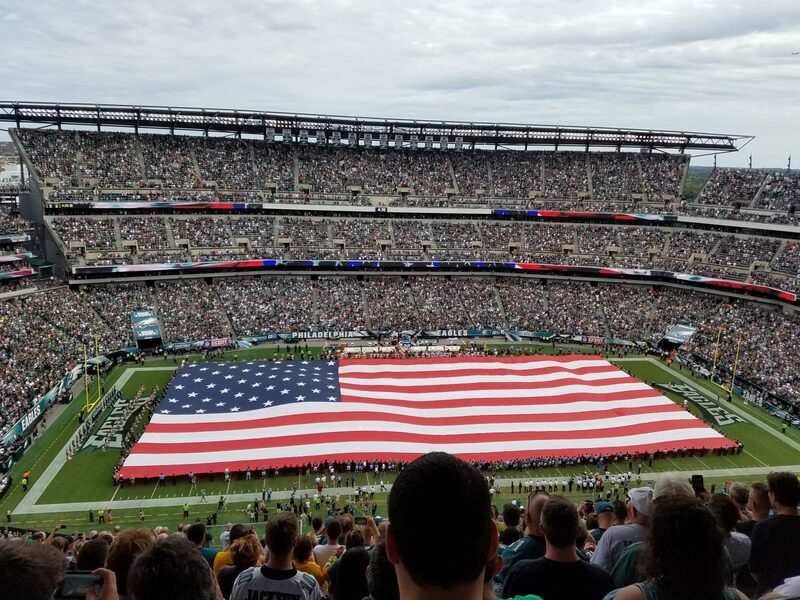 Much like the City of Philadelphia is treated like an illegitimate stepchild that sits in between the glitz & glamour of New York and the omnipresent lobbyists of Washington, DC, the 2017 Eagles and their city are the NFL’s version of Rodney Dangerfield – they just get “No Respect”. One would think that coach Doug Pederson has hammered this point home to his team. At least it certainly seems that way based on his rather curt press conferences this week. And that’s all good in my opinion…a “chip on their shoulder” mentally is just what this team might need. As pointed out by 97.5 morning show host Anthony Gargano, it was Phillies fans who, in the 2008 National League Division Series (NLDS) against the Brewers, got into their ace pitcher C.C Sabathia’s head to the point where he walked starting pitcher Brett Myers, which led to Shane Victorino following that up with a grand slam. At that point, even though it was only game 2 of the NLDS, you knew that the Brewers were done, and the Phillies went on to win the World Series for the first time in 28 years. Today, on what will be a cold, windy day with temps in the 30’s, Eagles fans will be more crucial to the outcome than any other game in recent history. This is a game where the fans will not only have to play the role of the “12th man”, but they will essentially have to make up for the loss of talent at the quarterback level by getting into the psyche of the opponent. The Eagles have had two weeks to prepare for this game and are playing a team that is used to the comforts of a climate controlled dome. Two weeks to digest and dissect what went wrong. Two weeks to figure out how to put their backup quarterback in the best position possible to succeed and move on to the NFC Championship. And with their fans in a frenzy, there is no reason why they can’t do so. Eagles win and sit on the doorstep of a Super Bowl in this enchanted season.